This article explains how to install and configure a multi-protocol VPN server using the SoftEther package. We enable and configure OpenVPN and L2TP over IPSec and SSTP VPN Servers on Linux. SoftEther VPN is one of the world’s most powerful and easy-to-use multi-protocol VPN software, made by the good folks at the University of Tsukuba, Japan. It runs on Windows, Linux, Mac, FreeBSD and Solaris and is freeware and open-source. You can use SoftEther for any personal or commercial use free of charge. First, you need to create a DigitalOcean Droplet. As mentioned in SoftEther’s website, SoftEther will work on almost every Linux distro with kernel v2.4 or above,; however it’s recommended to choose one of these distributions: CentOS, Fedora, or Red Hat Enterprise Linux. Personally I have tried it on Ubuntu, CentOS and Fedora, both 32 and 64 bit editions, and it has worked perfectly. Unfortunately, there is no way of getting the latest version through package managers (or even using a single url) at the moment. Therefore you have to browse their website using a desktop browser to download the package. There are a couple of ways of dealing with this: First, browse their website on your own computer and then depending on your server configuration (OS, x86/x64, etc.) find the link to the appropriate package then use wget to download the package to your server. Alternatively, you can use a terminal based web browser such as lynx to browse the SoftEther website and download the right package. This page contains all versions of the SoftEther available. Choose which version you want (in this tutorial we use v2.00-9387-rtm-2013.09.16) and then press Enter to go to the link. Now choose Linux and in the next page choose SoftEther VPN Server. Depending on your server hardware architecture, choose a package; the 32bit – Intel x86 and 64bit – Intel x64 or AMD64 work for DigitalOcean 32bit or 64bit droplets. Finally download the tar file from the next page by pressing the “D” key on the link, and choose “Save to disk” when asked by Lynx. After the file is saved, we can press “Q” to quit Lynx and move on with the installation. Note: On Fedora, I have found that the gcc package doesn’t get installed using the command above so you have to install it manually using yum install gcc. 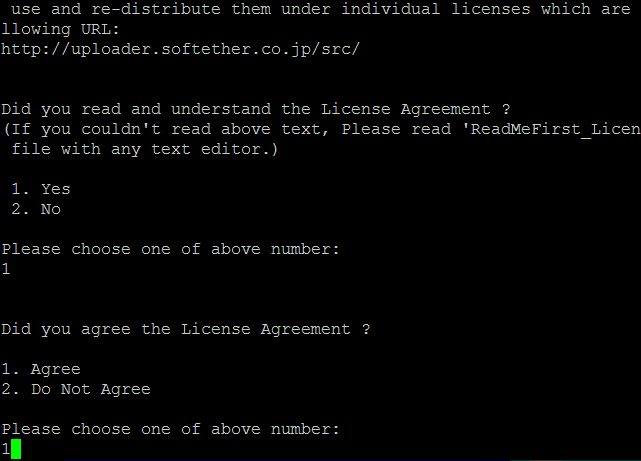 SoftEther will ask you to read and agree with its License Agreement. Select 1 to read the agreement, again to confirm read, and finally to agree to the License Agreement. SoftEther is now compiled and made into executable files (vpnserver and vpncmd). If the process fails, check if you have all of the requirement packages installed. Finally save and close the file by pressing esc and typing :wq to close vim. If all of the checks pass, then your server is ready to be a SoftEther VPN server and you can move on to the next step. Type “exit” to exit VPN Tools. There are two ways to configure SoftEther VPN server: you can use the Windows based server manager to manage and configure any number of SoftEther VPN servers from remotely; or use the built-in vpncmd tool to configure your servers. You can download SoftEther Server Manager for Windows using their website and do the configuration using the GUI that it provides, which is a preferable way if you are a Windows user. Here we use vpncmd to configure our VPN server. Press 1 to select “Management of VPN Server or VPN Bridge”, then press Enter without typing anything to connect to the localhost server, and again press Enter without inputting anything to connect to server by server admin mode. Next you will be asked to enter an administrator password for the hub. This password will be used whenever you are not logged in as server admin mode, and you want to manage that specific hub. There are two ways of connecting your hubs to the server network: using a Local Bridge connection or using the SecureNAT function. You can use each one separately, but using these two together will cause problems. Here we use SecureNAT, which is very easy to setup and works pretty well in most situations. You could also use Local Bridge, but then you have to install and configure a DHCP Server too. Now we have to create users for our Virtual Hub to use the VPN. We can create users for our Virtual Hub using the command UserCreate and view the list of current users by UserList. Users can be added to groups and can even have different types of authentication modes (including: Password, Certificate, RADIUS, NTLM, etc.). Enable L2TP over IPsec Server Function: Choose yes to enable L2TP VPN over IPSec with pre-shared key encryption. Now you can make VPN connections to this server using iPhone, Android, Windows, and Mac OS X devices. Enable Raw L2TP Server Function: This will enable L2TP VPN for clients with no IPSec encryption. Enable EtherIP / L2TPv3 over IPsec Server Function: Routers which are compatible with EtherIP / L2TPv3 over IPsec can connect to this server by enabling this function. Pre Shared Key for IPsec: Enter a pre-shared key to use with L2TP VPN. Default Virtual HUB in a case of omitting the HUB on the Username: Users must specify the Virtual Hub they are trying to connect to by using Username@TargetHubName as their username when connecting. This option specifies which Virtual Hub to be used if the user does not provide such information. In our case enter VPN. The SoftEther can clone the functions of Microsoft SSTP VPN Server and OpenVPN Server. But before we enable these we have to generate a self-signed SSL certificate for our server. You can use openssl or SoftEther’s own command to generate a SSL certificate. Note: OpenVPN’s default port is 1194, but you can change it to any port you want by changing the /PORTS:1194 part of the command above to your desired port or ports (yes it supports multiple ports). Depending on the client operating system and configurations, you could use any of the mentioned protocols. However, I prefer to use SSL-VPN since it’s both secure and fast, and also as mentioned before since it uses a common and well-known port (443 or https-port), it can penetrate most of the firewalls. Then just as you did when downloading the Server software, select the latest version (Here we used v2.00-9387-rtm-2013.09.16). Now choose Linux and in the next page choose SoftEther VPN Client. Now depending on your system’s hardware architecture, choose a package (The 32bit – Intel x86 and 64bit – Intel x64 or AMD64 works for DigitalOcean 32bit or 64bit droplets). Finally download the tar file from the next page by pressing the “D” key on the link, and choose Save to disk when asked by Lynx. After the file is saved, press “Q” to quit Lynx. 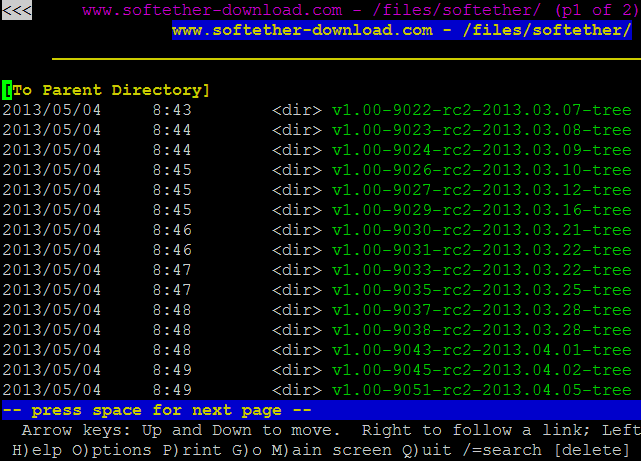 Note: Change softether-vpnclient-v2.00-9387-rtm-2013.09.16-linux-x86-32bit.tar.gz to your downloaded file’s name. Note: Instead of an IP Address, you could also enter you server’s fully qualified domain name (FQDN). Note: In order to make your connection to the server more secure and prevent man-in-the-middle attacks, it’s best to use a SSL certificate to identify your server. This can be done easily using SoftEther. To do that, first you must download the cert file to your client as explained in Step 10 and then using CertAdd add it to your client’s trusted certificates. Then, using command AccountServerCertEnable enable certificate verification for your VPN connection. In this article, we went through the process of setting up a SoftEther VPN Server using vpncmd which is a command line administration utility provided by SoftEther. All the things done here could also be done using SoftEther Server Manager for Windows, and it’s even easier to setup a SoftEther VPN Server using that tool. So I recommended you to use it if you have a Windows machine. That’s it. We have successfully installed and configured a multi-protocol VPN server using SoftEther. Now clients can connect to our server using L2TP, IPSec, SSTP, OpenVPN, etc.